On Friday five indigenous leaders in West Papua, the half of New Guinea under Indonesian rule, were charged with "treason." They were each sentenced to three years in prison for peacefully protesting the government. Barack Obama raised the issue of human rights in West Papua last November when he met with President Yudhoyono of Indonesia. It is time for the president to once again raise his voice to support human rights in this seemingly remote territory. Obama's interest West Papua stems, in part, from personal experiences growing up in Indonesia with his mother, Ann Dunham Soetoro, a cultural anthropologist. In his autobiography, Dreams from My Father, he recalls a conversation with his step-father, Lolo Soetoro, who had just returned home after a tour of duty with the Indonesian military in West Papua. Obama asked his step-father: "Have you ever seen a man killed?" Lolo responded affirmatively, recounting the bloody death of "weak" men. West Papuan intellectuals and political activists, kin of the "weak" men killed by Lolo Soetoro, have read Obama's autobiography with keen interest. Even as many Americans have lost hope in their President, many West Papuans still embrace the message from the 2008 campaign, "Yes We Can." Taking inspiration from the people of Tunisia who rose up to depose President Ben Ali last year, and the populist spirit that spread out from Tunisia with the Arab Spring, West Papuans are harboring seemingly impossible dreams. After 50 years of living under a brutal Indonesian military occupation, West Papuans are hoping to reach a peaceful political solution to this conflict. 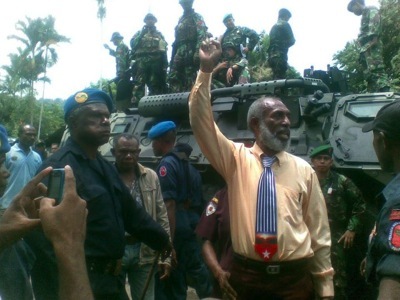 One West Papuan leader, Forkorus Yaboisembut, remains hopeful against all odds. He was detained last October, moments after being elected president during the Papuan People's Congress, and is among the men who were convicted Friday for "treason." Thousands rallied behind him, demanding independence from Indonesia, at this event that was peaceful by all accounts. As the Congress was concluding, the delegates were surrounded by an estimated 3,100 Indonesian police and military personnel with a cordon of armored cars. Scores of my friends, people who I know from working as a cultural anthropologist in West Papua, were in the crowd. I had a sleepless night as I monitored Facebook and text messages from the other side of the world, following the developments in real time. Markus Haluk, the leader of a Papuan youth group, sent a text message saying "in these next few moments we might see a massacre and a bloodbath." Videos circulating on YouTube show Indonesian troops firing assault rifles into a crowd from armored personnel carriers, while others pistol whip and kick delegates. Unarmed civilians desperately tried to clamber into their cars while uniformed police officers and plain clothes thugs beat them. In 1998 I witnessed a massacre in West Papua that killed upwards of 150 civilians, so I feared the worst. When the dead were counted from the violent crackdown at the Papuan People's Congress, I was relieved to learn that the carnage was minor by local standards. Human Rights Watch concluded that three civilians were shot dead by Indonesian police on October 19th, 2011. Over 300 delegates to the Papuan People's Congress were initially detained by Indonesian security forces. On the heels of these arbitrary detentions, U.S. Secretary of State Hillary Clinton voiced alarm. She said that the United States has "very directly raised our concerns about the violence and the abuse of human rights" in West Papua. Most of the delegates to the Papuan People's Congress were quickly released, except for five leaders who were charged with inciting rebellion. Forkorus Yaboisembut is among these five, along with Edison Waromi, the newly elected Prime Minister. Last Friday they joined upwards of 90 people in Indonesian jails who have been identified by Amnesty International as prisoners of conscience. Indonesia is the fourth largest country in the world. The United States regards Indonesia as a "strategic partner" and has considerable influence in the country's political, economic, and strategic affairs. Clearly tales of Indonesia's ongoing war in West Papua troubled Barack Obama as a young man. Now, as an adult, he is in a position to support the "weak" power of non-violent resistance with a few carefully chosen words. President Obama should join Amnesty International and Human Rights Watch in calling for the unconditional release of West Papuan political prisoners.